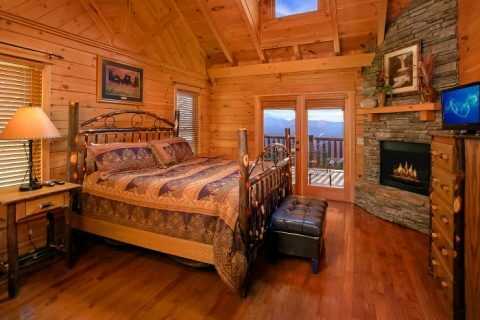 "Above The Smokies" is a Smoky Mountain cabin rental with 5 bedrooms and luxury amenities designed to make your stay truly unforgettable. 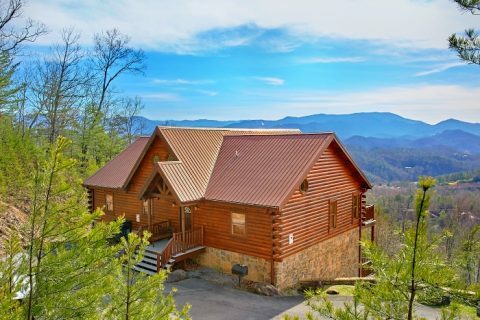 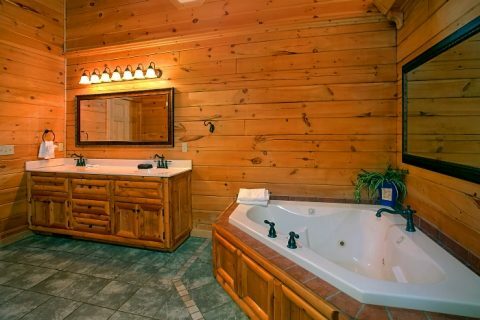 Thanks to this rental's prime location only a short drive from Dollywood and Downtown Pigeon Forge, guests of this log cabin won't have any trouble finding fun attractions to experience. Better yet, this secluded, luxury cabin boasts beautiful views of the Smoky Mountains that make it easy to relax and unwind. 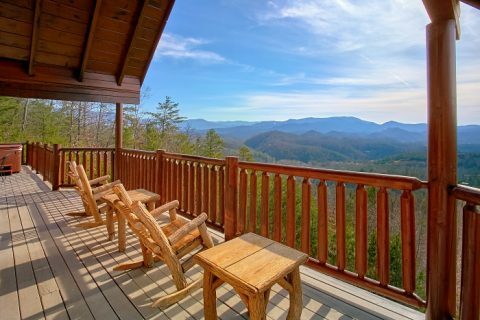 A stay at "Above The Smokies" gives guests the chance to enjoy the scenery that makes the Smoky Mountains area one of the most popular destinations in America. 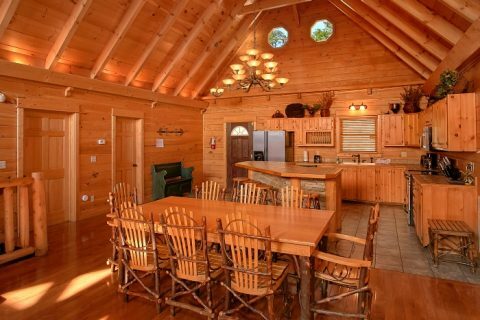 As soon as you step into this cabin's main living area, you'll be glad you reserved such a quality cabin in the Smokies. 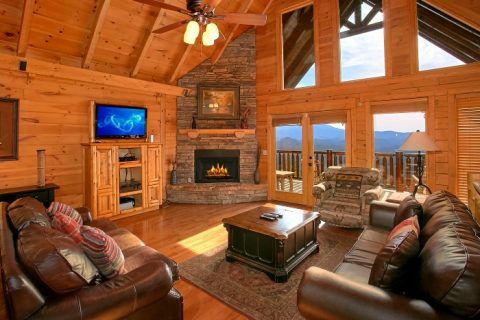 From the large picture windows to the floor-to-ceiling, stacked-stone fireplace, this space is perfect for spending quality time with the people who matter most. 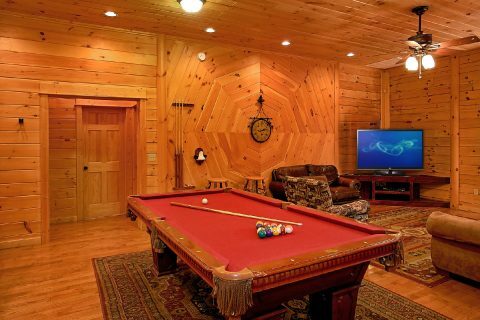 This room also boasts comfortable furnishings and a 42" HD Plasma television with surround sound. 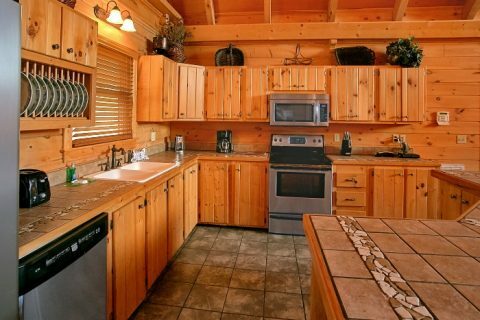 In your cabin's full kitchen, you'll find everything needed for making delicious dinners during your stay. 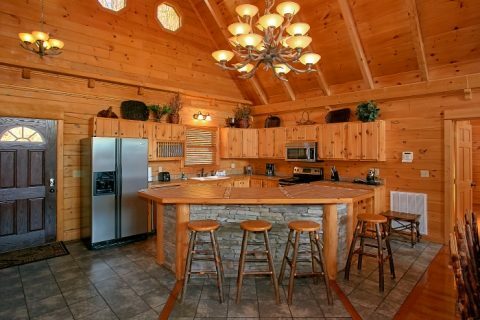 Once dinner is served, your cabin offers plenty of space for everyone to gather together at the custom kitchen island with seating for 6 and the lovely dining table with seating for 8 people. 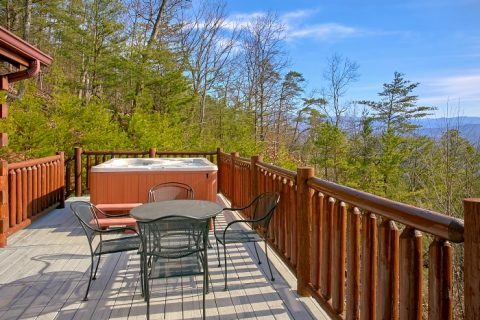 Step outside onto your cabin's deck to fully experience this rental's excellent view. 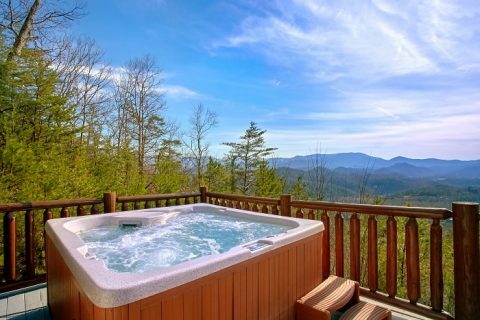 Whether you're sitting back on patio furniture or sinking into the warm waters of your cabin's 7-person hot tub, you can enjoy this cabin's incredible view to the fullest. 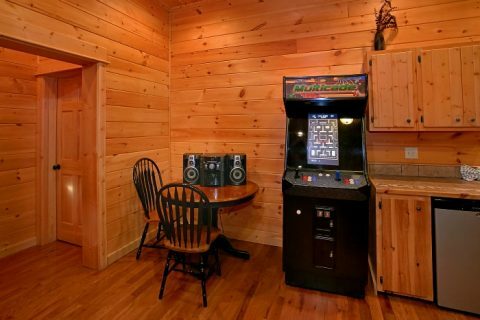 Downstairs in your cabin's game room, you'll find plenty of entertainment on the billiards table and multi-game 2-player arcade game. 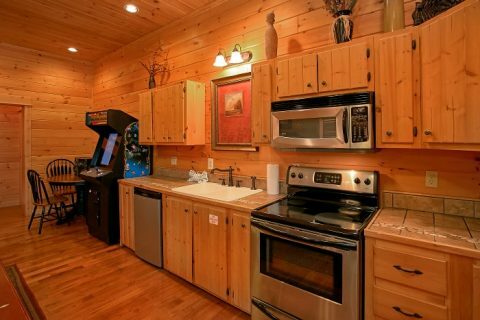 You'll also find a sitting area complete with a 52-inch flat screen TV and another full kitchen area. 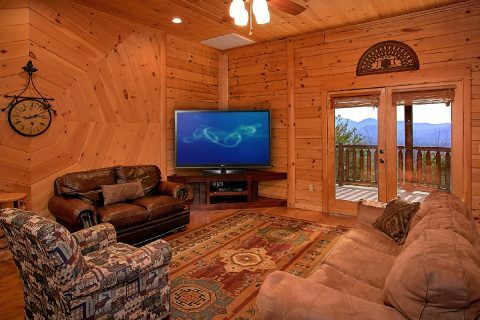 From here, you can step outside onto a spacious lower deck that's perfect for enjoying the pure mountain air. 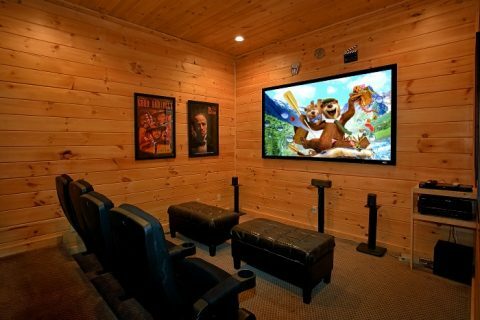 Nearby, you can enjoy your cabin's home theater system complete with theater seats, a large projector screen, and surround sound. 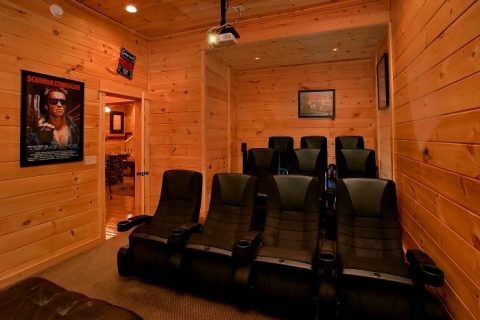 This room comes complete with a Blu-Ray DVD player and cable so you can see your favorite movies or the big football game like never before. 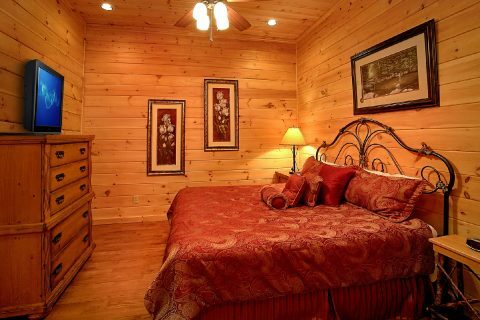 For staying well-rested on your vacation, this luxury cabin comes complete with 5 king-sized bedrooms and 2 sleeper sofas. 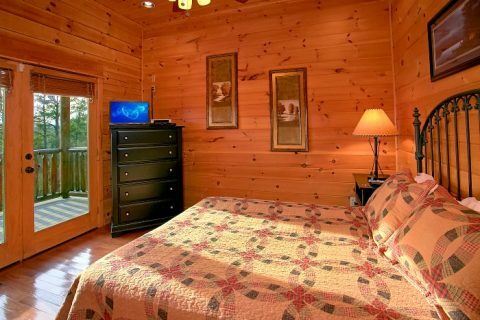 You'll find your cabin's first 3 bedrooms on the lower level complete with private televisions. 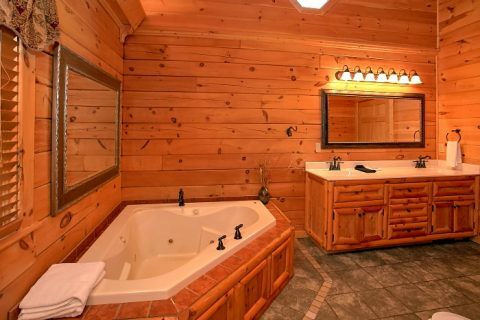 Upstairs, you'll also enjoy two master bedrooms that boast 27-inch televisions, DVD players, access to the upper deck, double vanities, 5-foot walk-in showers, and jacuzzi tubs. 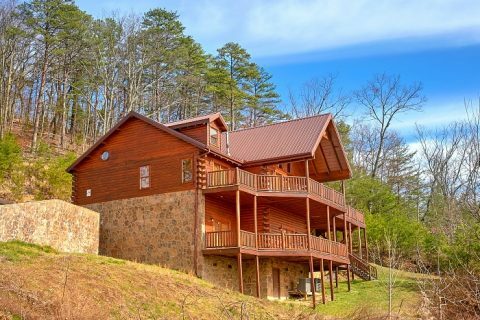 This cabin also provides you with wireless Internet access, a washer/dryer, and a charcoal grill for enjoying a cookout on your vacation. 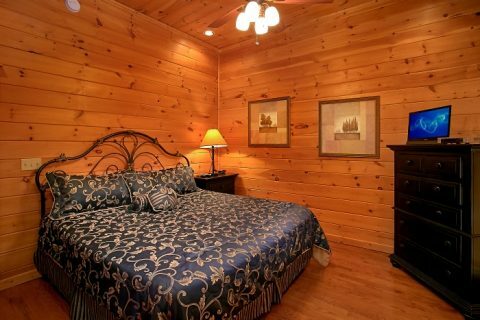 Best of all, you can enjoy true cabin luxury without paying a luxury cabin price! 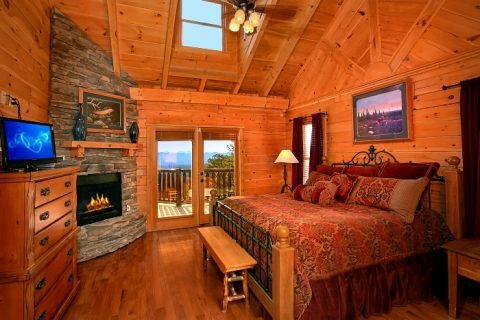 Simply book "Above The Smokies" online with Cabins USA Gatlinburg to earn a special 15% discount on your stay!